Love Island series two winners Nathan Massey and Cara De La Hoyde are clearly keen to keep their love story going, as they've just got engaged. And in an interesting turn of events, Nathan proposed to Cara in the spot where they met - in the Love Island villa (whether the current Islanders were also there hasn't been revealed). Speaking to OK! Nathan said that he wanted to remind his girlfriend of where they first fell for each other in 2016. "I brought her back to where we met and took her on a little treasure hunt around the villa to different places which meant something to us," he said. "Finally, I blindfolded her, led her to the pool and got down on one knee." And Cara clearly appreciated his gesture, as she called it "so romantic". "This is where we met – we've come full circle," she said. 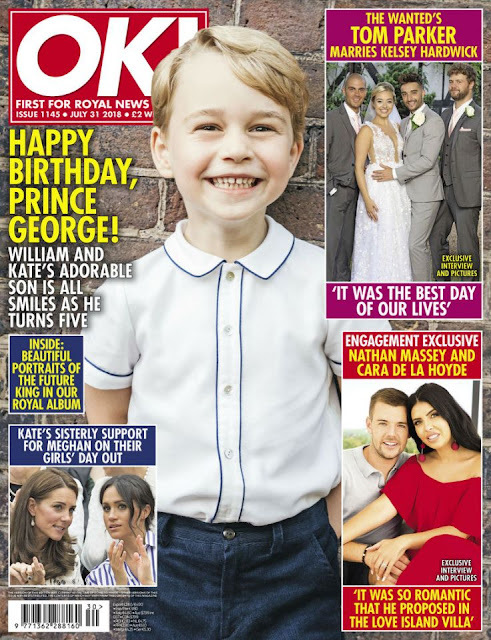 The couple, who welcomed their son Freddie-George in December 2017, did split up for a while before their baby was born and Cara revealed that she was struggling with anxiety at the time. "I had bad depression, and coming out of Love Island I had really bad anxiety," she said. "I didn't know how to cope with the attention and the fact my boyfriend was going to nightclubs to do personal appearances. "It got to a point where we loved each other but we just weren't happy, and then when I fell pregnant we made that conscious decision that it's not right to be together at the moment, but if it's meant to be, then it will work. "We didn't think we would get back together, but we did." You can read the full interview in OK! magazine, which is on shelves on Tuesday (July 24).